A SEARCH of Mary MacKillop on the Internet today highlights just how far the saint’s influence has spread. Dioceses have her as their patron, schools and child care centres and ministries carry her name, and the work of the sisters extends across the globe. Today, there are 835 sisters in the Josephite order. However, in the past two years only six women attended final professions, and two took their first professions. “In the 1950s when we had 40 or 50 sisters attending final professions each year,” the order’s congregational leader Sr Monica Cavanagh said. “There are a smaller group of women taking vows, so certainly we will get smaller. “However, there will always be a form of religious life and a yearning to live life with a Josephite heart – living in spirit and in mission. 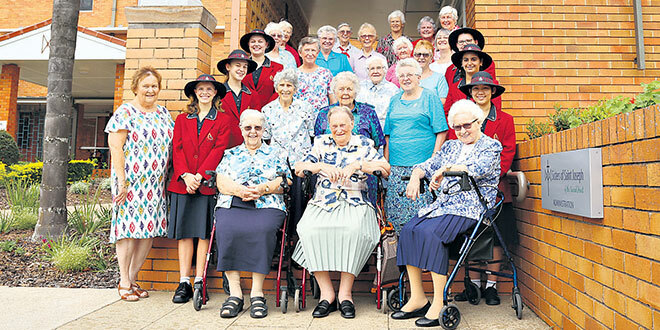 Over the passage of time, the Josephite congregation of sisters has spread throughout Australia, and to New Zealand, Peru, Ireland and beyond. “Education is still a very important dimension of who we are,” Sr Cavanagh said, although she recognises that the work of setting up and running schools has largely been handed over to Catholic education offices. “We might have a sister who is helping a migrant settle in or teaching how to cook a meal or go to the shops, so the teaching background has helped us in our continuing mission. “As we have seen new needs in society emerging, some of the sisters have taken up in new areas. Another example is the sisters’ ministry in East Timor, which is part of Mary MacKillop International. It began as a response by the Sisters of St Joseph to a request by the Bishop of Dili, Carlos Belo, to help his people during East Timor’s struggle for independence. Now the sisters work to advance the people of East Timor through literacy education in the Tetun language, as well as supporting health education, compassionate care and other educational and cultural initiatives. Twenty-five MMI staff in East Timor deliver the programs, with the sisters working alongside them. Beyond the work of the vowed sisters, the Josephite Associates carry on the order’s calling to serve the community. These are 4750 women and men from all walks of life working as associates. There are also women who take private vows to the Josephites, while others are part of a group covenant. “Mary and Julian, our founders, responded to the heartbeat of the world, and we are still trying to do that,” Sr Cavanagh said. “We are being asked to keep what Mary MacKillop stood for alive in our complex society. Asked what might be one future challenge for the order, Sr Cavanagh had no hesitation in answering. “Saving our planet,” she said. “I think Mary MacKillop would be saying in today’s world the environment expresses who God can be.